Domenico Quaranta & Geraldine Juárez. In more than five years of activity, the Free Art and Technology Lab (F.A.T. Lab) produced an impressive series of projects, all developed with open source software, shared online and documented in a way that allows everybody to copy, improve, abuse or simply use them. This approach situates F.A.T. Lab in a long tradition of DIY, processual, sharable artistic practices based on instructionals, and reveals a democratic idea of art where Fluxus scores meet hacker culture (and rap music). Featuring texts by Régine Debatty, Evan Roth, Domenico Quaranta, Geraldine Juárez and Randy Sarafan, The F.A.T. Manual is a selection of more that 100 projects, done in the belief that printing these bits on paper will allow them to spread in a different way, infiltrate other contexts, and germinate. An archive, a catalogue, a user manual and a software handbook documenting five years of thug life, pop culture and research and development. The F.A.T. Manual is co-produced by Link Editions, F.A.T. Lab and MU, Eindhoven in collaboration with XPO Gallery, Paris. With generous support from Baltan Laboratories, Eindhoven and Creative Industries Fund NL, Rotterdam. Friday November 15 at 8:00pm at MU, Eindenhoven! A limited printed edition will be available during the event. 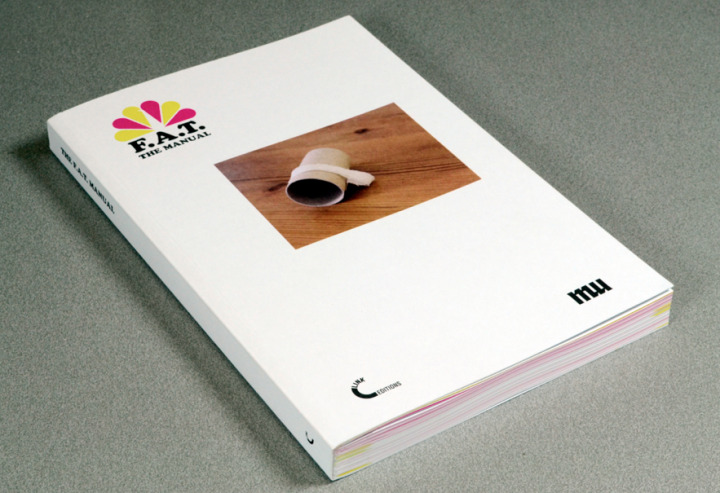 The F.A.T Manual is available on-line for free at F.A.T and Link Editions.